We’re hitting the home stretch. The regular season is almost here and hockey will enrich all of our lives once more. So far in the off-season, we’ve had questions asked about the Buffalo Sabres from top to bottom, speculated on just what would happen with Cody Hodgson and his contract, and everything in between. But with so little time left until the puck drops on the regular season, what do the Sabres look like for 2013/14? Yours truly is here with a comprehensive look. The forwards were Wednesday, today the defensemen, tomorrow with the goalies. Reminder: we’re breaking down the forwards by top six and the reserves, with ratings of 1-5 for both units as well as a rating for the defensemen overall. Let’s get to it. Unlike the forwards, there seems to be a bit more certainty when it comes to the top six defensemen on this team. Tyler Myers is back once again and looking to regain the form that won him the Calder Trophy in 2010. He admitted that he’d come into the season last year recovering from injury and never quite got into shape. When he’s on, there are few talents like him in the NHL. He’s big (6’7”) with uncanny skating ability for his size. He uses his reach well though he could stand to use his size to his advantage much more often. He’s patient and skilled with the puck but he needs to learn when to advance the puck and not hold onto it. He’ll have his former mentor Henrik Tallinder back in the fold to guide him. Since Tallinder left, it’s been a downward slide for the young Myers and many feel Tallinder was brought into the fold to resuscitate Myers’ career. He’ll add a calming veteran presence but if he can turn Myers back into the Myers of old, he’ll have done his job in spades. Christian Ehrhoff is back and looking to take on a bigger role with the Sabres after a fine season last year as the team’s best defender. He looked worlds better than he had in his first year with Buffalo, making sound defensive plays and putting himself in the right position more often than not. Ehrhoff will need to chip in more offense on the back end, as he was signed to do, but his play in the defensive zone has been a breakthrough and a revelation for the Sabres defensively. He’ll theoretically have more help this year so he could really take off in year three in Buffalo. Also returning to the fold is Mike Weber. Quietly reliable, Weber was the physical presence of the defense last year. He’ll never dazzle anyone offensively, chipping in here and there, but he’s sound in his own end and a tenacious defender. He’s reportedly stepped into more of a leadership role during the off-season as well. Weber is one of those unsung players that every team needs. The last two spots are up for debate, though one of them will likely go to newcomer Jamie McBain. Traded from Carolina for Andrej Sekera, McBain is the offensive defenseman of the group; the guy brought in to lead the rushes and help bolster the power play. He struggled in his final year in Carolina but definitely has the potential to be an impactful player on the Sabres back end. As for the final spot, it looks like it’ll be an interesting race. Mark Pysyk has looked much improved thus far, looking sharp defensively and leading end-to-end rushes like a seasoned pro. 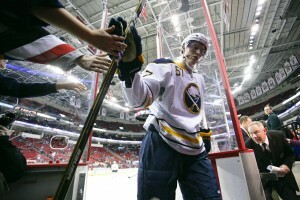 Standing between him and a spot in the lineup, however, is 8th overall pick Rasmus Ristolainen. Risty has been receiving rave reviews from coach Ron Rolston for his work on the power play. He’s also a huge body with strong skating ability and heads up play in his own end. Regardless of who wins the battle, Rochester is going to end up with a quality defenseman. The group improved as last year went on but still yielded the most shots against per game. The goaltenders were up to the task at times but the team can’t expect to give up nearly 34 shots per game and win. If Myers can rebound, Ehrhoff and Weber can build off of last year, Tallinder can provide a calming veteran presence, and one of the youngsters can step into the fold and make his mark, this unit could end up being very, very solid. Should someone in the top six fail, there are options behind them that can step into the lineup without missing a beat. As mentioned above, either Pysyk or Ristolainen will be sent to Rochester when all is said and done and will likely be the first called up in the event of an injury or a severe slump. Nice to be carrying another NHL-ready defender in your AHL ranks, eh?Behind that is veteran Alexander Sulzer. Suzler is not the ideal situation for a top-six defenseman but when pressed into the lineup, he was mostly solid if invisible – not a terrible trait for a defenseman. If you’re not noticing him, he’s unlikely to be screwing things up horribly. There’s also Chad Ruhwedel, the 23-year-old who saw time at the end of last season was all but lost. He looked lost at first but played well in his last few games and had a strong camp this year before being sent to Rochester. He’s another quality short-term option for the Sabres. Behind them, the massive Brayden McNabb awaits. At 6’5” 200lbs, he brings size and a defensive oriented game to the table. He’s still working on his skating as most big guys need work in that area and many feel that it’s just a matter of time before he cracks the Sabres. Though lacking a star at the moment, the Sabres have depth on depth on depth. Should injuries happen, they have four guys in the AHL who could fill in admirably in the short-term with one (maybe two) who could make a good chunk of NHL teams as full-time players. The Sabres have potential on the back end. Myers always has the ability to rebound and they are littered with solid, smart veterans. Depth is a major plus for this unit as they should be able to withstand injuries unless things start to creep into “Walking Dead” territory. I must say that their rating would be higher if we knew what to expect out of Myers. He shows flashes where it looks like he might finally have it only to slip back into the issues that have plagued him the last couple of years. If he gets close to where he was, this could be one of the better units in the league. If not, it’s still pretty solid but lacking top-end talent. Ryan is a lead writer for The Hockey Writers as well as editor for Mile High Sticking and co-owner of The Farm Club. Follow him on Twitter to discuss all things puck, Bills football, or his hatred of all things Philly.